Pumpkin soup holds a special place in my heart. My all time favorite dish when I was growing up was a traditional Korean pumpkin porridge. It's a thick, sweet porridge made simply with pumpkin and sweet rice flour. Every time I have this porridge now, it brings me right back to a chilly, snowy day in Korea when I would snuggle up to a bowl of steamy porridge. 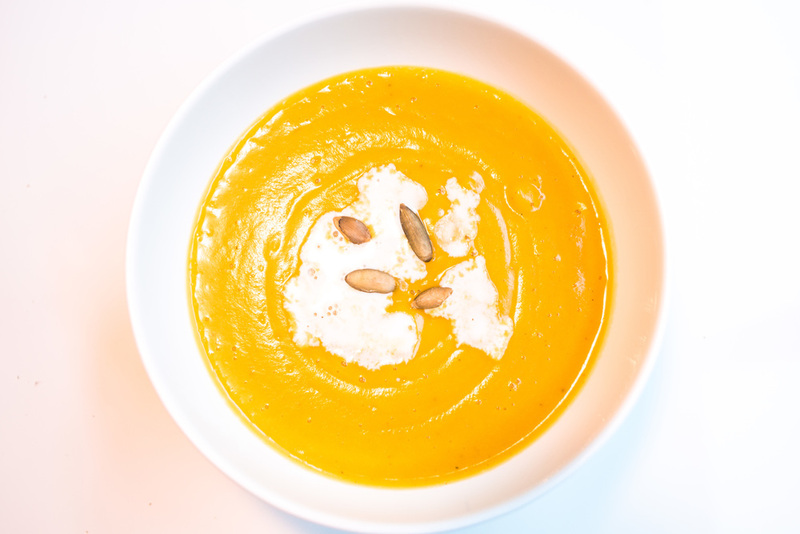 I am so nostalgic for my pumpkin porridge that every time I see pumpkin soup on a menu, I must order it - which is exactly what I did last Friday at Absinthe Brasserie, a lovely French restaurant the husband and I visited for date night last week. Their pumpkin soup was absolutely delicious - so creamy and velvety smooth with the perfect amount of sweetness. As soon as I tasted it, I knew I had to recreate a dairy free version at home. Timing worked out perfectly, too, since the husband had to get two of his wisdom teeth pulled this week so he's pretty much had to be on a liquid diet. Soup to the rescue!I used kabocha squash for the soup for its nuttiness and sweetness. Regular pie pumpkin can easily be used in place of the kabocha, though, just depends on your preference. Also, you don't necessarily have to scoop out the flesh and can add the skin into the soup as well (just make sure to wash the squash!). I opted to scoop out the flesh from the skin to get a bright orange color for the soup, but it's definitely easier to throw it all in the pot. This soup turned out so incredibly smooth and creamy without the use of any dairy. It has the perfect consistency and just the right amount of sweetness, thanks to the kabocha squash and maple syrup. I also added in a bit of nutmeg to complement the nuttiness of the squash. It is light yet filling due to its high fiber content and so satisfying to have on a chilly day. It will make a great lunch paired with a salad or the perfect starter for your next holiday meal! Preheat the oven to 400 degrees. Using a sharp knife (and being very careful! ), cut off the top of the squash and cut in half. Remove the seeds and strings with a spoon and place the squash on a baking sheet lined with parchment paper, cut side down. Roast in the oven for 45 - 50 minutes, until the squash is easily pierced with a fork. In a medium sized pot over medium heat, add coconut oil or ghee. Add the shallots and cook for 3 - 5 minutes until translucent. Scoop out the flesh from the squash (or add in with the skin) and add to pot. Add in remaining ingredients and cook until simmering, mashing the squash as it cooks. Carefully transfer the soup into a high speed blender or use an immersion blender to puree the soup until smooth. Transfer the soup back into the pot once pureed. Reheat the soup for 3 - 5 minutes and adjust seasonings as needed. Serve in bowls topped with additional coconut milk and pumpkin seeds. Enjoy!